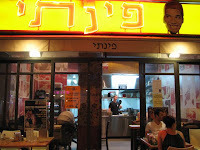 This famous Jerusalem origin Middle Eastern restaurant opened a branch in Tel Aviv and since then gained a lot of fans. Pinati has the typical Middle Eastern food like, skewers, couscous (yummy with kebab), hummus, mujaddara, but also pasta, schnitzel and beefballs. But for something special, you should try the kubbeh soupKubbeh is a dumpling-like ball, made of semolina and stuffed with ground beef. 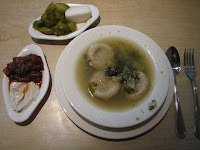 The kubbeh balls are served in a light soury broth of celery, onions and zucchini or in red broth, which is made of beetroot. The sour broth is the most pungent (and also the most recommended) one, thanks to the combination of the zingyness of the lemon juice in the soup and the savory taste of the beef in the balls. This Iraqi-Kurdish dish is a hit and rarely found in the city center. The main dishes are served with pita, tehina, pickled cucumbers and a sweet-spicy spread, all on the house. Go down on Bograshov. It is on the right side when you are facing the beach.